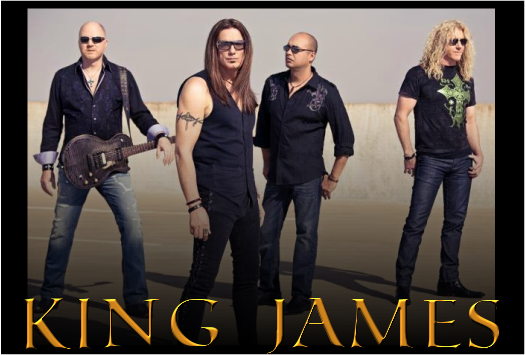 Hailing from the USA,King James was formed in 1993 by guitar extraordinaire Rex Carol who was the lead axe man for Whitecross back in the 80's and early 90's. KJ started out as a supergroup consisting of Rex Carroll(Whitecross) , Jimi Bennett(Sacred Fire,Viktor) , Robert Sweet(Stryper) , Tim Gaines(Stryper). In order to kick things off, the band released a 3 track demo with the songs "Holding On" , "Desperate", and "Prisoner". Rex Carrol and Jimi Bennett joined forces after coming to know one another in Buffalo, NY at the Kingdom Bound Festival. Both were looking to go in a new music direction and so they decided to form a band with this intention. Rex and Jimi both contacted Bassist Tim Gaines & Drummer Robert Sweet who were in a down time mostly due to the 90's Grunge scene having an effect on the Metal scene. People were starting to listen to more Alternative bands in place of Metal bands. Basically, we saw the emergence of a band so super that they were able to overcome the music scene changes of their day. In 1994 King James released their self-titled full length album. With members from bands like Whitecross, Stryper, and Sacred Fire, King James had the attention of the Metal community. With the shredding abilities of Rex Carroll(Whitecross) to the impressive upper-range vocals of Jimmi Bennett(Sacred Fire) to the Sweet base lines of Tim Gaines(Stryper) to the precise drumming skills of Robert Sweet(Stryper), the band was poised for success. After touring for a few years, King James went through some changes as Robert Sweet & Tim Gaines returned to Stryper. Then in 1997 the band was ready to release their sophomore album. In 1997, KJ released the follow up to their 1993 debut self-titled release. 'The Fall' was King James answer to the ever so prevalent grunge scene that had taken over. Sometimes you just have to adapt or die. The band chose the former and adapted their musical style with a more harder, deeper, louder, nasty attitude. We also saw the joining of two new members in Bassist Scott Banks and in Drummer Dave Greers. Upon its initial release, "The Fall" did great in Europe, Considering the limited resources of Viva Records. However, with the album only being available to the U.S. as an import, the band members decided to turn towards other options. Whitecross decided to reform so Rex Carroll left to rejoin with them and Jimi Bennett formed the band 'Viktor' with Louie Weaver(Petra). Scott Bennett does a great job with the psychedelic alternative vocal work. We find that Scott has traded in his polished vocals for a more deeper-grittier sound helping to complete their grunge transformation. As you would expect, the guitars have a grungy crunchiness to them not unlike other bands of the Grunge scene. This album really shows just how versatile Rex Carroll is cause he had previously been easily recognized due to his "trade mark" Metal shredding styles. Yes, if you didn't know that it was Rex on this disc then you would have a tough time guessing it. 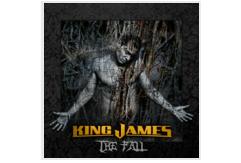 In 2010 King James re-released their 1997 album 'The Fall' with new cover art and some re-mastering to enhance the album's sound. In 2013, King James released their sophomore album titled 'MaXimus' and WOW!! what an album. I'm sorry that it took me so long to purchase this little jewel. MaXimus showcases everything from driving Power Metal to Rock to 70's style noodling and rounds it all out with a heaping dose of Blues guitar riffs. If you didn't know the release date of this album you would probably say that it was released back in the 80's. The instrumental arrangements on this album with everything from Drums to Guitars, makes the band on this album, come across as a Jam-Band. This is a good thing because there just isn't many christian Jam-Bands out there. The only one that actually comes to mind is the band 'Affector'. Lead VocalistJimi Bennett reminds me a lot of 80's Vocalist Joey Tempest(Europe) however, Jimi is no clone due the fact that he isn't as polished as Joey and has more of an edge to his vocal delivery. Guitarist Rex Carroll Really shines with this album finding him playing everything from Power Metal riffs to Acoustic Guitars to Blues Guitar styles. However, the Blues Guitar work seems to stand out on this project. Were talking Blues on the same level as America's finest Blues shredder-Neal Schon(Journey). Rex quickly reminds us of where he came from with the killer solo "Maximus" that's noticeably in the veins of "Nagasake"from his former days with Whitecross. 'MaXimus' showcases a few songs that were originally on their debut release like the tunes "Hard Road To Go" , "Prisoner" , "Desperate" , & "Miracles". 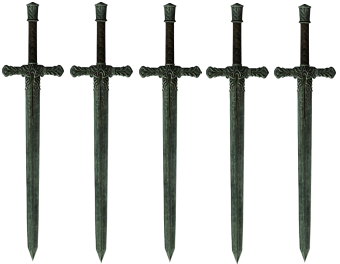 "Just as I Am (Lamb Of God)"
(See Site Info for Sword Scale meaning)This grade is for the album "Maximus". If you like bands like Journey, Europe, Whitecross, or even Stryper, then do yourself a favor and and Pick up a copy of this 'MaXimus' release.